1. To state with assurance, confidence, or force; state strongly or positively; affirm; aver: "She asserted her ownership of the diamond." 2. To maintain or defend (claims, rights, etc.). 3. To state as having existence; affirm; postulate. 4. To assert oneself, to insist on one's rights, declare one's views forcefully, etc. 5. Etymology: from Latin assert-, past participle of asserere, "to join to"; which came from ad-, "to" + serere, "to join, to connect". 1. Confidently declared to be so. 2. Strongly stated to be so but without proof; alleged. 1. Stating or expressing positively. 2. Declaring or affirming something solemnly and formally as true. 1. Confidently aggressive or self-assured; aggressive; dogmatic. 2. Inclined to bold or confident assertions; aggressively self-assured. In an assertive manner; affirmatively: "She walked assertively, or confidently, in front of the microphone to explain her political position." 1. Strongly insistent, self-assured, and demanding behavior. 2. Aggressive self-assurance; given to making bold assertions or emphatic statements. 1. 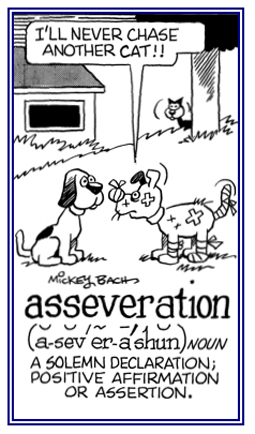 Stated positively; affirmative; such as, an assertory declaration. 2. Affirming; maintaining; emphatically making a declaration or statement. To state or to declare seriously or positively; to affirm earnestly: Mary asseverates that she will go to the movie whether her husband, Jim, goes or not. © ALL rights are reserved. An emphatic declaration, an affirmation, or a strong statement of assurance: After so many crashes and lack of availability, Sam made an asseveration that he would never use that online company again. © ALL rights are reserved. 1. To leave (a person, place, etc.) without intending to return; especially, in violation of a duty, promise, or the like: "He deserted his wife." 2. With reference to military personnel, to leave or run away from (service, duty, etc.) with the intention of never returning. 3. To fail (someone) at a time of need: "He felt that all of his friends had deserted him." 4. 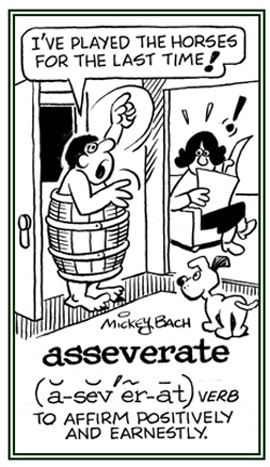 Etymology: from Old French deserter, "leave"; literally. "to undo" or "to sever a connection"; from Late Latin desertare, frequently of Latin deserere, "to abandon" from de-, "undo" plus serere, "to join". 1. An area of land, usually in very hot climates, that consists only of sand, gravel, or rock with little or no vegetation, no permanent bodies of water, and erratic rainfall. 2. a place or situation that is devoid of some desirable thing or overwhelmed by an undesirable thing: "They had to live in a town with cultural desert." 3. 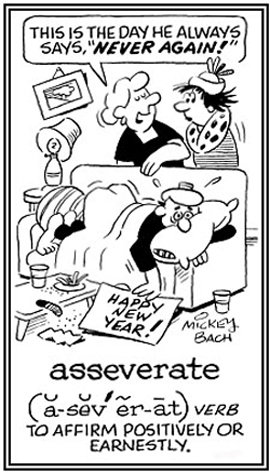 Etymology: from Old French desert, from Late Latin desertum; literally, "a thing abandoned", a noun use of the neuter past participle of Latin deserere, "to forsake". Showing page 1 out of 4 pages of 46 main-word entries or main-word-entry groups.